Some weeks ago, I read an interesting Forbes article claiming that Intuition is the highest form of Intelligence. I have some sympathy for this view although I would use Knowledge rather than Intelligence. Human intelligence is usually assessed through an intelligence quotient (IQ) and/or an emotional quotient (EQ). My diagram below pictures 4 types of Knowledge: Intelligence, Intuition, Fantasy and Beliefs. The risk management terms "(un)known" and "(un)knowns" have been borrowed from Nassim Nicholas Taleb's 2001 book Fooled By Randomness (PDF). These 4 types of Knowledge also appear in my blogs about the 4 levels of Consciousness, being: conscious (eg, intelligence, beliefs, fantasy), subconscious (eg, intuition), unconscious, and superconscious. The idea for the X and Y axis came from a recent Nautilus article which mentioned work by Susan Fiske, who is a professor at the Princeton University Department of Psychology. Susan Fiske categorizes her X and Y axis by warmth and competence, which I translated in emotion and ratio for my diagram. 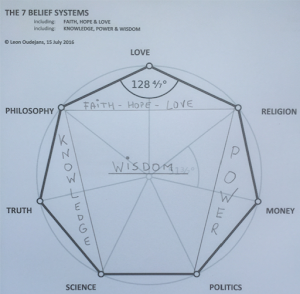 My diagram plots Wisdom in the center as Wisdom uses all 4 types. The diagram raises some interesting observations: Beliefs are low on emotion and high on ratio. 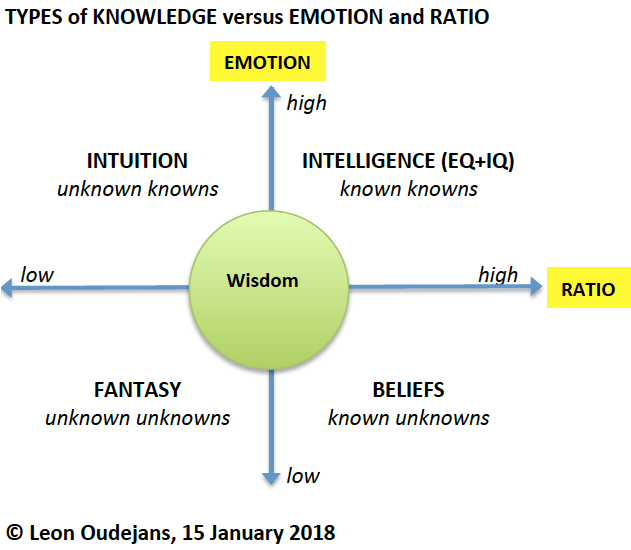 Intuition is the opposite: high on emotion and low on ratio. Intelligence (IQ and EQ) is both high on emotion and ratio. Fantasy has little relationship with emotion and ratio. Our emotions are often stronger than our ratio, especially in case of aggression, anxiety and fear (eg, Nautilus). Our intuition senses danger and fear while our intelligence tries to minimise such seemingly overdue evolutionary emotions (eg, my blog). Hence, my sympathy for the Forbes article: if highest means strongest then I cannot but agree. 1 John 4:18 claims: "There is no fear in love. But perfect love drives out fear, because fear has to do with punishment. The one who fears is not made perfect in love." If this is true then I have never met perfect love. I do believe in François de La Rochefoucauld's words: "We promise according to our hopes (intelligence) and perform according to our fears (intuition)".